$2,200,000 THE WITTHOEFFT RESIDENCE, ARMONK. SKIDMORE, OWINGS & MERRIL ARCHITECT ARTHUR WHITTOEFFT, 1957. 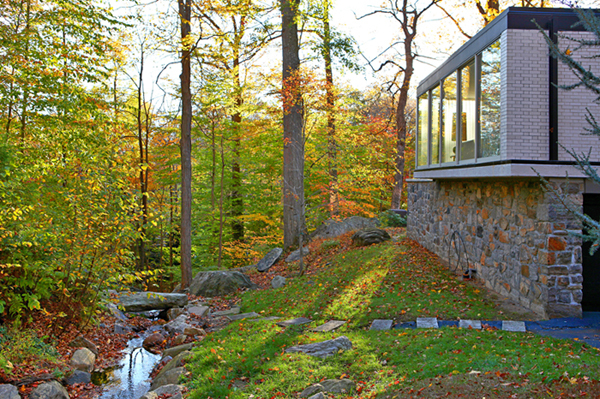 Exposed steel, white iron speckled glazed brick, floor-to-ceiling glass and all the crisp clarity of The International Style brought together in a compact residence nestled in the woodlands of Westchester County, New York. The single-story house is a taut rectangular volume of 95 feet x 25 feet, nine 10-foot bays plus 2.5-foot cantelevers at each end. The layout is sharply articulated by a matte black exposed steel frame in stark contrast to the white brick infill. Completed by Arthur Witthoefft, SOM architect in 1957, followed by a 2007 rescue and multi-year restoration updated for today’s living, now officially on the State & National Registry of Historic Place.BY THE NUMBERS: 2.7 ACRES ABUT NY STATE WATERSHED LAND, 2,500 SQUARE FEET, 4 BEDROOMS PLUS LOWER LEVEL STUDY/DEN, NATURAL, RESTORED STREAM, 4 SIDED, TRAVERTINE, STAINLESS STEEL & SLATE ARCHITECTURAL FIREPLACE, STAINLESS STEEL & TEAK COOKS KITCHEN, 6 PERSON FAMILY SPA/WATER FEATURE, 100 FOOT FLOATING TERRACE SLICING THROUGH GRANITE BOULDER OUTCROPPINGS, NEW YORK STATE & NATIONAL REGISTRY OF HISTORIC PLACES, DESIRABLE CUL DE SAC WHIPPOORWILL/ARMONK LOCATION, 45 MILES TO NYC.